Word has been received of the death of Jean Zielasko, wife of Rev. John Zielasko, who served as executive director of Grace Brethren Foreign Missions (now Encompass World Partners). She died this morning at 4:50 a.m. (November 12, 2013) at her residence in Winona Lake, Ind. She was 91. She was born on October 28, 1922 in Primrose, Pennsylvania to Frances Turner (Beatty) and Robert Finley Beveridge Sr. On July 22, 1944 she was married to Rev. John W. Zielasko, who survives in Winona Lake, Ind. They spent 15 years as missionaries in Brazil under the Grace Brethren Missions. Jean graduated in 1940 from Minersville High School in Minersville, Pennsylvania, and was a homemaker. She was a member of Lakeland Conservative Grace Brethren Church of Warsaw, Ind., where she was involved in the Women’s Missionary Fellowship, and a member of the Women’s Missionary Council, and she was a member of the Winona Lake Literary Club. She was an avid reader and letter writer. She played the accordion and piano, and sang in the church choir and ladies quartets. Her hands were never still as she was often seen knitting, quilting, writing, sewing or baking. The Lord seemed to bless all who came to know and love her. She is survived by her husband of 69 years, Rev. John W. Zielasko (Winona Lake, Ind. ); and her four children: John R. (wife Sharon W.) Zielasko (Hemet, Calif.); Ann L. (husband H. James “Jim”) Tallman (South Bend, Ind. ); James M. (wife Terri L.) Zielasko (Winona Lake, Ind. ); and Janet S. (husband Dr. Thomas L.) Ryerson (Corona, Calif.). She also leaves behind fourteen grandchildren: Corrine A. Tallman, Clinton J. (wife Lenka) Tallman, Chad M. Tallman, Tyler J. (wife Kari B.) Zielasko, Christopher J. (wife Crystal L.) Zielasko, J. Douglas (wife Ladeen L.) Zielasko, Kendra M. (husband Sean A.) Smith, Evan G. (wife Kathryn L.) Ryerson, Elyssa F. Ryerson, Elena S. Ryerson, Elliot J. Ryerson, James R. (wife Tiffany) Hatch, Jeffrey D. (wife Sel) Hatch, and Jerod R. (wife Rachael) Hatch. As well as twelve great grandchildren: Joshua, Suzy, Isaac Smith, Jackson, Layla and Ryland Zielasko, Emery Zielasko, Logan and Glenn Hatch, Jerod Hatch, Lucy and Liam Hatch. She was preceded in death by her parents, brother Robert F. Beveridge, and her daughter-in-law Suzan M. (Goodman) Zielasko. Her funeral service will be held on Friday, November 15, 2013 at 2:00 p.m. at Redpath-Fruth Funeral Home 225 Argonne Road, Warsaw, Indiana and officiated by Dr. Russ Simpson. Burial will follow at Oakwood Cemetery of Warsaw. There will be visitation prior to the service on Friday, November 15, 2013 from 12 noon – 2:00 p.m. at Redpath-Fruth Funeral Home. 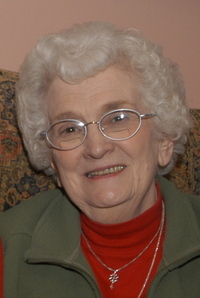 Memorial donations in Jean’s name may be directed to the Missionary Fund c/o Lakeland Conservative Grace Brethren Church, 2538 S. County Farm Road, Warsaw, Indiana 46580 and would be appreciated by her family.